Portland architecture, engineering firms have plans in place if economy begins to slip. 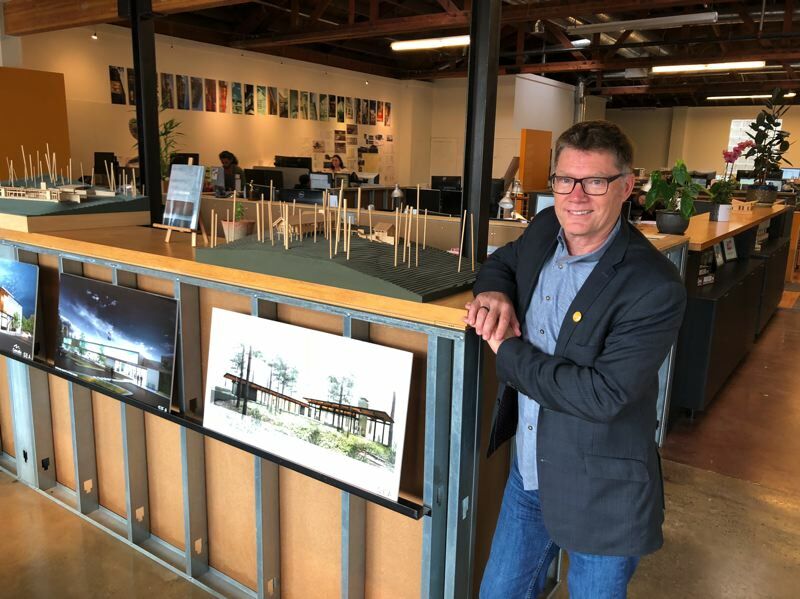 Oregon's building industry was experiencing a design and construction boom in 2008 when Sid Scott felt something wasn't right at his firm, Scott/Edwards Architecture. The Portland-based firm usually tried to keep a balance between the public and private design work on its plate. But when Scott sat down and tallied up the firm's projects, he found a little more than 80 percent of the work was from private clients. He and his staff immediately embarked on what he calls a "hard marketing" effort to build the firm's public work back up as quickly as possible. It turned out to be a saving grace one year later when Oregon's economy took a nosedive and the activity of private projects in the Pacific Northwest's building industry came to a standstill. "We landed a number of public projects right as the private sector tanked," Scott said. "That carried us through the recession." Maintaining diversity in projects is one of the lessons he's made sure his firm has remembered even as it's ridden high on a local building boom that is holding strong since the Great Recession ended. Scott says he's optimistic the current activity will continue to be healthy into 2019, but he also knows the construction industry operates in cycles. Robert Murray, chief economist and vice president of Dodge Data & Analytics, has identified four of those upturn-downturn cycles. The first, a seven-year cycle, started in 1975. That was followed by a nine-year cycle that started in 1982. A third cycle started in 1991 and lasted 10 years. The average number of expansion months for those cycles: 56. The fourth cycle, which the U.S. is currently in, started in 2011 — an expansion that has lasted more than 100 months. But Scott and others in the building industry know such escalation isn't sustainable. "There are always ebbs and flows," Scott said. That's why he and his partners are taking steps now to make sure their firm is in a secure spot in case industry activity begins to slow. Because Scott and his staff were able to drum up enough public work to fill the gap when private work dried up during the recession, the firm was able to limit the hit it took from the economic downturn. SEA had to let two employees go, but was able to hire one back even before the economy started improving. Ed Dean and his team at Nishkian Dean weren't so lucky. 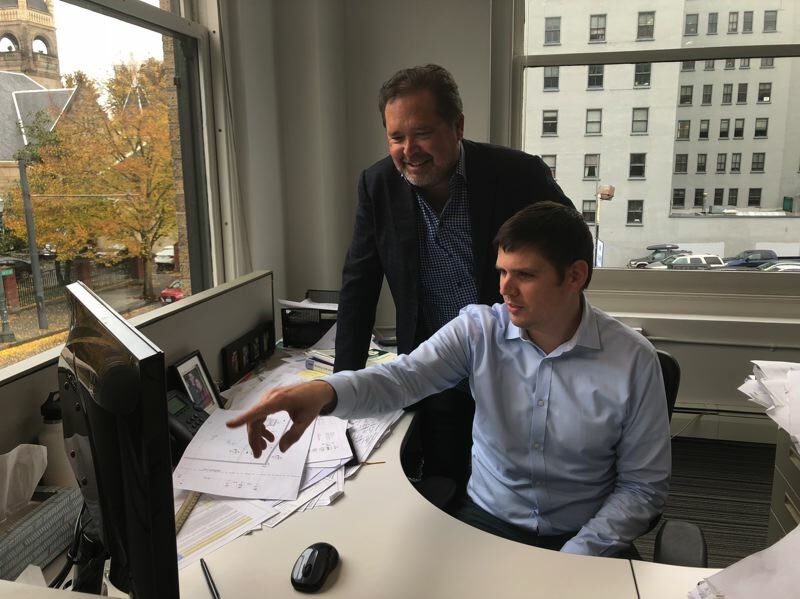 The Portland-based engineering consulting firm had already made plans to relocate to a new office on Southwest Salmon Street when the Great Recession hit. As local projects dried up, Dean's firm was able to keep its new doors open by picking up work from another office in the Nishkian family, San Francisco-based Nishkian Menninger. But even so, some staff cuts had to be made in the Portland office. At the lowest point, there were five or six people left, a staff reduction of about 50 percent from pre-recession numbers. These days, Nishkian Dean has enough work to keep it busy for six to nine months — considered a healthy workload for an engineering firm. But Dean and his team have been careful when it comes to adding people. Rather than rush out to fill seats, the firm has done what Dean calls a "slow ramp up" to bring staff numbers of about 18 employees. If more people are needed for a project, the firm can tap staff at Nishkian Menninger or at two other Nishkian offices in Montana and Los Angeles. "We're not over-hiring," Dean said. "We're keeping the workforce at a constant level." Nishkian Dean also has made a conscious effort since the most recent recession to diversify the type of projects it works on. When the economy collapsed, the firm was focused on commercial projects in the private sector. While those projects still make up a large portion of the work Nishkian Dean handles, the firm has stepped up its business development efforts to increase the number of public projects it's working on at any given time, especially in the aerospace launch-facility market. One of the firm's most notable projects in that area, for example, was its work on the Commercial Crew Transportation Capability project at Space Launch Complex 41, which recently won the Juror's Favorite award from the Structural Engineers Association of Oregon. At SEA, the firm has taken diversification one step further by adding an entirely new division. During the recession, Scott noticed a lot of renovation and tenant improvement projects popping up. So, he and his staff decided to tap that market by adding an interior design practice to the firm. "You want to broaden your base so you're not relying on one specific sector to carry you all of the time," he said. "When times are tough, there's a lot more renovation and tenant improvement work." Like Nishkian Dean, SEA has been careful to keep its hiring to a level that Scott feels could be maintained even if work slows slightly. When the firm needs expertise in a certain area for a specific project, rather than hire a new employee, it partners with firms in other parts of the country. For a 911 emergency center project for Washington County, for example, SEA worked with a firm from Florida that had expertise in that project type. Scott's firm also has been able to keep its workforce at a constant level by being willing to turn down some projects. While Scott says it's never easy to say "no," an extra focus on client relationships — even when turning down a project — can help an owner or developer understand why the firm isn't able to pick up a project without hurting the potential to pick up future work with the client. At 75 employees currently, SEA is considered one of the larger firms in the Portland metro area. Making sure employees are cross-trained in areas such as the project management technology the firm has invested in since the recession helps keep projects flowing even with a streamlined staff. But for a small firm like Nishkian Dean, keeping a lean employee roster can create challenges. Smaller firms like Dean's often don't have marketing staff. Instead, firm principals and senior staffers follow the do-sell approach, where they're responsible for going out and finding new projects even as they work on active contracts. That can be a difficult balance to maintain, according to Dean, and he and his staff meet regularly to make sure they're giving equal attention to hands-on project work and finding new opportunities. "If you focus exclusively on [getting] projects done, and you don't have projects to follow, that puts you in a difficult situation. So, one of the lessons we learned is to make sure we focus on our business development efforts." he said. While Dean is largely optimistic for both the building industry and his firm heading into 2019, there is one situation he's noticed that he's watching closely. Prior to the last economic downturn, project owners and developers became less willing to spend more money than budgeted for their buildings. Lately, Dean's seeing that start to happen again. When project bids from contractors are coming in over budget, which Dean says isn't unusual even in a strong economy, developers are starting to ask Dean's firm to use value engineering to find ways where projects can be scaled back or adjusted without drastically affecting the quality of the end result. But even with those adjustments, when repricing is done, the projects are stilll over budget. "It's as if you're chasing an escalating market that you can't ever catch up," Dean said. "When we've seen that in the past, that's the point at which a lot of developers when they aren't forced to build will stop and wait for the market to slow down." The escalating cost of building materials isn't something that industry experts expect will change any time soon. After a steady rise earlier this year, building materials prices showed a slight month-over-month dip in August. But that was an aberration, according to Anirban Basu, chief economist for Associated Builders and Contractors. In September, materials costs had increased again, and were 7.4 percent higher than one year earlier, according to an ABC analysis of U.S. Bureau of Labor numbers. While rising materials costs don't create the types of patterns capable of sending the economy into a tailspin, Dodge Data & Analytics economist Murray said they do have the potential to slow down building activity. Workforce availability can a have a similar impact. Oregon's lack of a skilled workforce is one area that Oregon economist Bill Conerly sees as posing a potential threat to productivity, which is tied to economic stability. The building industry, like most industries in Oregon, is already finding it hard to attract enough skilled workers. Conerly expects that dearth to continue, and possibly worsen. 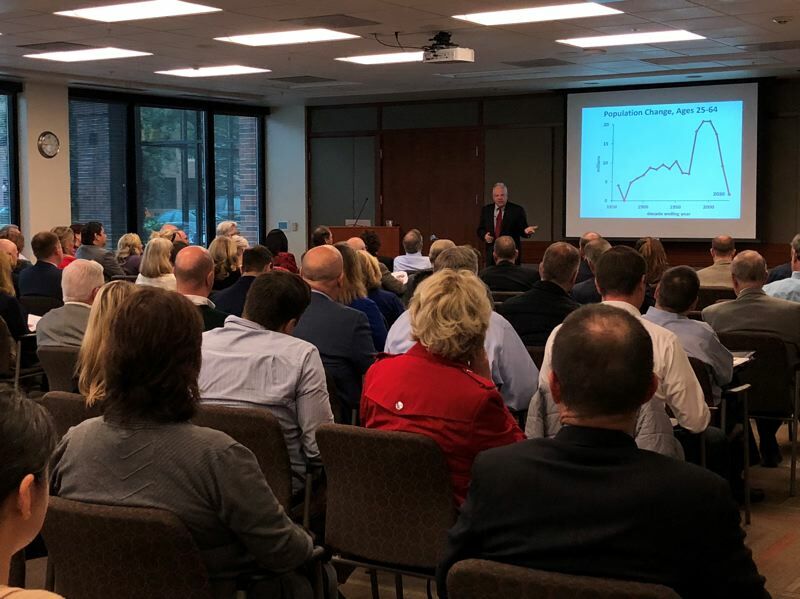 Beginning in 2020, the U.S. will enter a decade of the slowest growth of working-age population since the Civil War, he told attendees at last month's 2018 Fall Kruse Way Economic Forecast hosted by the Lake Oswego-based Buckley Law. Even with labor challenges, though, Conerly says he sees Oregon's economy staying in mainly positive territory into next year. However, he also cautions that doesn't mean firms in the building industry — or any industry — should let down their guard during 2019. He recommends that firms take advantage of flush times now to prepare for lean times that may arrive later time. "The U.S. economy will grow," Conerly said. "The Portland economy will grow ... but everyone should still have a contingency recession plan in place."